Instagram may still be full of photos of England players on their holidays following this summer’s World Cup but it’s already time to start getting excited about the start of the new domestic season. This weekend sees the first round of fixtures in the Football League before the Community Shield plays its traditional role of season opener once again. As ever, the big match at Wembley Stadium sees the winners of the Premier League and FA Cup go up against each other. This year’s match between Man City and Chelsea may be missing a few stars because of the World Cup but you get the feeling it has a little more riding on it than normal. Both Pep Guardiola and Maurizio Sarri understand that this pales into insignificance compared to the trophies up for grabs in the coming season but both managers have their own reasons to want to win. For Guardiola it’s all about doing all he can to ensure that Man City kick on and enjoy a period of dominance in English football while Sarri is targeting a fast start to his time at Chelsea manager. Tens of thousands of tickets have already been sold for what promises to be a hot and sunny day at the national stadium and we’re going to try and make the most of the action by picking out some bets that will hopefully secure some profit before the Premier League begins next Friday. Both Man City and Chelsea have already played in some mouth-watering fixtures this pre-season thanks to their participation in the International Champions Cup. Neither were quite able to give the best account of themselves though as Guardiola and Sarri had to use a number of fringe players in the place of those who competed in the latter stages of the World Cup. Man City will continue to be particularly weakened in the Community Shield with a host of stars including Kevin De Bruyne, Vincent Kompany, John Stones, Kyle Walker and Raheem Sterling likely to find that Sunday comes too soon for them. However, Guardiola has been full of praise for the young players who have stepped into the breach during pre-season so far and he is confident in their ability to secure a result against Chelsea. Every Man City player who takes to the pitch at Wembley on Sunday will know exactly what their role is. You can’t, in all confidence, say the same about the Chelsea players as they continue to learn how to fit into Sarri’s style. If Sarri’s Napoli team are anything to go by, Chelsea fans should be excited about how far the Blues can go under his management but winning the Community Shield at this early stage could just be a step too far. Therefore, Man City do look the worthy favourites at 23/20 with William Hill. Man City players celebrate winning the Community Shield against Chelsea in 2012. 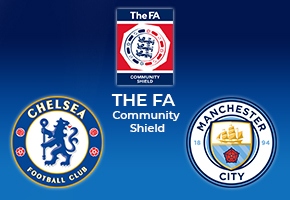 Neutrals tuning into Sunday’s match will be hopeful of a repeat of the 2012 Community Shield between these two teams. Man City just about edged an entertaining game 3-2 but we’re not so sure this one will be quite so dramatic. As well as the number of players who are either missing or not yet up to full fitness following the World Cup, the weather forecast is for sun and temperatures potentially in excess of 30C. That’s enough to tire anybody and we think it will slow the tempo of play down significantly. Bear that in mind if you’re getting involved in the Correct Score market where the Man City 2-0 selection is tempting at 10/1 with Coral. It says a lot about the strength in depth at Man City that they can be missing some of their star players and still have Sergio Aguero, Gabriel Jesus and Riyad Mahrez in their squad on Sunday. Just like last season, the battle between Aguero and Jesus for a starting place will be very interesting over the coming months but Mahrez will be feeling the most pressure to perform early doors following his £60 million move from Leicester. The Algeria winger had an injury scare recently but scans show no significant damage to his ankle so he should start at Wembley. Mahrez is a very tough player to stop when in full flow and he could just open the scoring at odds of 11/2 with Coral. 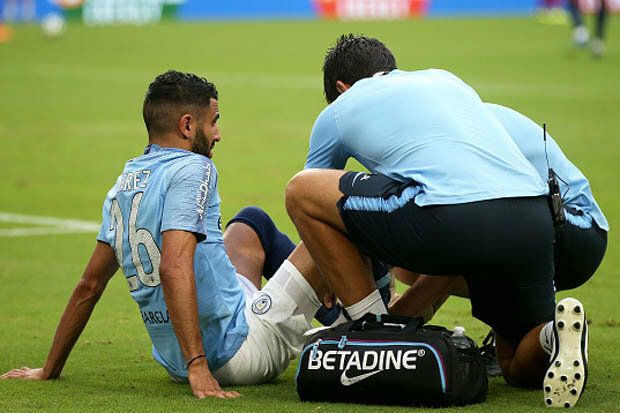 Riyad Mahrez receives treatment before being forced off in Man City’s friendly against Bayern Munich.